I must start by saying that “Ratatouille” is my favorite animated film, for quite obvious reasons! 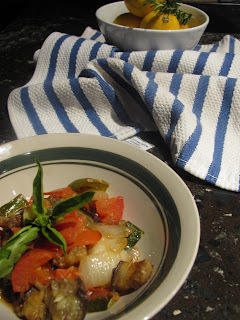 Even before the movie came out, I always loved ratatouille, especially the one my mother makes; she serves it over white rice and adds chicken. This was a go-to (quick and easy) dinner for her to prepare, and one of her favorite one-pot recipes. The traditional ratatouille is a simple recipe of summer vegetables found in Southern France. Tomatoes, zucchini, and eggplant form the basis for the dish, but other summer produce is a welcome addition. The unique quality of ratatouille is that it is usually served very soft; the vegetables may even be cooked for 2 hours for all the flavors to intertwine completely. This easy recipe takes no more than 30 minutes to prepare, and the vegetables have a nice bite to them. Also don’t worry about leftovers, ratatouille can taste even better the next day. Some people enjoy eating it cold or at room temperature, which is perfect for a hot summer day. Put ratatouille on pasta, rice, salad, or in a panini, and you will soon learn to love the versatility and simplicity of ratatouille. 1. Cut the eggplant and place in a colander. Sprinkle with 1/4 teaspoon salt and set aside in sink for at least 10 minutes. Then, rinse eggplant with water and pat dry with paper towels. You can skip this step if you use baby or Japanese eggplants. Meanwhile, prepare and chop other ingredients. 2. In a large sauté pan with lid, nonstick preferred, heat 1-2 tablespoons oil, just enough to coat the pan. When hot, add the eggplant. Cook for 5-7 minutes or until it begins to brown. Then add the pepper and cook another 5 minutes, stirring frequently. 3. Add the zucchini and onions and stir for 2-3 minutes. Finally, add the thyme, garlic, tomatoes, and ¼ tsp salt. Cover and simmer for 10 minutes. Set aside and let cool before serving. 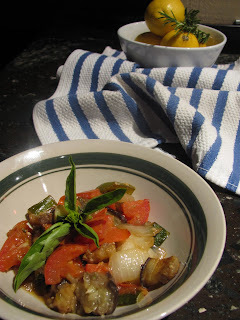 Garnish with basil leaves or add chopped basil into ratatouille at the end of cooking. Additional Information: Also appropriate for vegetarian, vegan and gluten free diets.